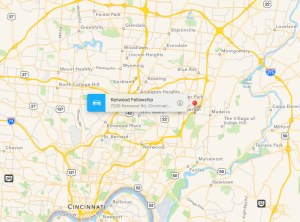 Kenwood Fellowship is centrally located on Kenwood Road, near I-71. • From the north, take I-71 South to exit 12 for Montgomery Road. At the end of the ramp, turn right onto Montgomery Road. Turn left at the third traffic light onto Kenwood Road. The church will be about 0.4 mile on the right, after crossing under I-71. • From the south, take I-71 North to exit 11 for Kenwood Road. At the end of the ramp, turn right at the light onto Kenwood Road. The church will be within 250 feet on the right. Walk around to the back of the building and enter the door to the Recreation Hall that faces I-71. For interactive Google map, click here. After a formal business meeting, we have Show & Tell, where members can describe miniatures they’ve brought to share. Each month we feature either an informational presentation or a hands-on program to make an item. Light refreshments provided by members are served at the end of the meeting, when there is time to socialize. Meetings last approximately 1.5 to 2 hours. Unless posted otherwise, MSC meets at 7 pm on the second Wednesday of each month. There is no charge to attend as a guest. If you are 16 years old and above, you are welcome to come to any regular meeting. * If you come and see activities you enjoy, we hope that you will consider becoming a member. For more information about becoming a member, see the Membership & Guests page or feel free to contact us.